Most of you already know that Microsoft Vista is a resource hog in terms of disk-space-consuption and memory (RAM) but this is ridiculous. 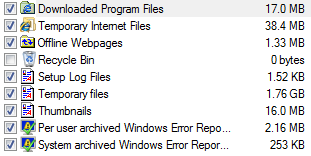 Today I got an alert in Microsoft Vista that my 20G partition is running out of space and has nearly 300MB left in it. I have all my programs installed in a seperate partition AND all my documents / desktop is also in another partition. It was really surprizing for me. 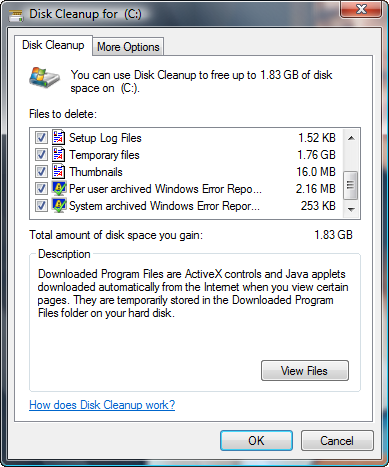 I ran Disk Cleanup and it revealed there 2GB can be freed from primary partition where Vista is installed. Here are the screen-shots. but you do kno that once u run disk cleanup on vista the ‘hibernate’ feature gets disabled and u need to enable it again !!! I didn't knew that hibernate gets disabled.